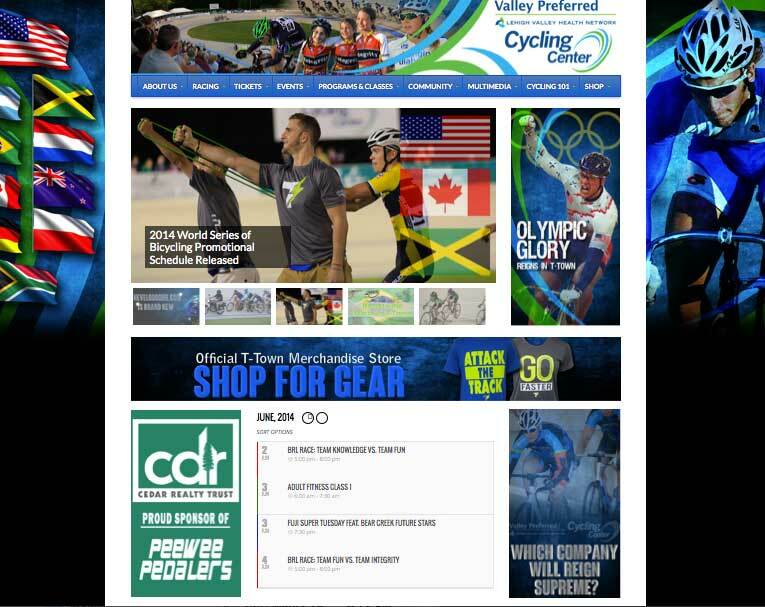 TREXLERTOWN, Pa. – Valley Preferred Cycling Center is pleased to announce the launch of a newly redesigned website. Thevelodrome.com is completely redesigned, and brand new for the 2014 season. The site is flush with new features, sections, pages, and more. The goal of the website redesign process was to create a more user friendly and engaging website for visitors to access. The newly redesigned thevelodrome.com allows users to access everything Valley Preferred Cycling Center has to offer, in a clear, easy to use manor. With the help of The Factory Advertising, founded by Ed Frack and his web designer Kathryn Armstrong, thevelodrome.com has moved into a new age of access for its fans. There is a bevy of new and exciting features on the new website, not the least of which being the new option for fans to purchase tickets online. Fans now have the option to purchase single race tickets for the event of their choosing, through Ticket River online ticketing. Fans can select the number of tickets they want, where they would like to sit, and their name will automatically be added to a will call list generated for that particular race. Fans can then pick up their tickets at the will call window on the night of the race. The addition of online ticketing will create an overall ease in attending a race at Valley Preferred Cycling Center. Visit our Tickets <http://thevelodrome.com.s180070.gridserver.com/tickets-groups/single-race-tickets/> page for more information. The full calendar of events is fan interactive, and simply easier to use than on the previous version of thevelodrome.com. The calendar shows how many events are going on any given day, and clicking a particular day creates a list of events, similar to our homepage calendar, allowing visitors to interact with each event. The brand new navigation menu on thevelodrome.com allows users to navigate the site with greater ease than ever before. The menu contains information about Valley Preferred Cycling Center including staff directory, history, etc., information on our racing series, including information for fans and riders, ticketing options, race results, and more. Our cycling programs and classes are organized according to age group under the Programs and Classes tab, and all events, including VeloFest and the Victory BrewGrass Fest are located under the Events tab. Information for the community is located under the Community tab for those interested in things like our Bike Safety Program, and Donation Requests. The Multimedia tab serves as a hub for visitors to interact with Valley Preferred Cycling Center in the form of social media, photo galleries, news, and video content on the brand new T-Town TV <http://thevelodrome.com.s180070.gridserver.com/multimedia/t-town-tv/> . Cycling enthusiasts can access the Cycling 101 tab to get information on local cycling routes, bike safety, the ins and outs of track cycling, and more, and visitors can shop for T-Town merchandise by clicking the Shop <http://thevelodrome.com.s180070.gridserver.com/shop-2/> tab. Located near the bottom right of the homepage is a brand new weather forecast area. The sport of cycling is dependent on weather conditions, and by detailing what the current conditions are at the track, visitors, riders, parents, etc. will know exactly what the weather is at the track at the time of their event. The goal has been to make thevelodrome.com more user friendly, and this directly accomplishes this. Located to the top and right of the homepage calendar is scrolling announcement graphics. The full width scroll will feature graphics allowing visitors to purchase tickets, shop for merchandise, etc., as well as urgent announcements as they happen, such as weather cancellations. Located to the right of the homepage calendar, a scrolling box will feature information on different cycling classes, special events, etc. These two sections will showcase featured events that are taking place at Valley Preferred Cycling Center. A large feature that most visitors will notice immediately is the Olympic Glory graphic located next to the featured stories. Celebrating the Olympic history of Valley Preferred Cycling Center is important to the facility, and showcasing the strides cycling has made in the Lehigh Valley, and beyond, is vital to our purpose. Valley Preferred Cycling Center is proud to enhance the sport of cycling, and lives of those who participate in it at our facility. Valley Preferred Cycling Center has produced 9 Olympians through its world-class cycling programs, a statement not many facilities in the world can make. Bob Rodale’s vision has been realized, and we are proud to continue it. Many individuals and groups played a role in the redesign of thevelodrome.com <http://www.thevelodrome.com> . We would like to recognize their hard work. From April through September, Valley Preferred Cycling Center hosts professional cycling events, amateur events, youth bicycle racing leagues, and developmental cycling courses for all ages. The Valley Preferred Cycling Center is committed to providing the community with cycling programs that promote education, fitness, and healthy competition. The Factory Advertising is committed to helping their clients find the best solutions without spending more than they need to. They offer marketing, market research, strategic planning; advertising and campaign strategy; design and copy writing; website development and Internet marketing; Email marketing, social media and content strategy and management; Media planning, research, scheduling and placement; Public Relations. Let them help you light up your message!